After the war, on March 6, 1866, Will married Louisa Frederici in St. Louis, Missouri and their first child, Arta Lucille, was born the same year. 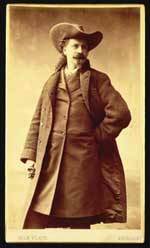 Three more children would follow - Kit Carson, named after the famous frontiersman, in 1870; Orra Maude, in 1872, and Irma Louise in 1883. In 1864, at the age of 18, he enlisted in the army and fought for two years against the Confederacy. In 1866 he married Louisa Frederici. After being discharged from the army he moved to Salt Creek Valley, Kansas where he soon started serving as a scout and guide. He also used his skills to provide meat for the crews working on the railroad. During this period he fought in as many as sixteen battles with Native Americans, and was hunting guide for the wealthy and famous visiting the West, including Grand Duke Alexis of Russia.